Cleveland has a new tea house. It opened in October 2015. 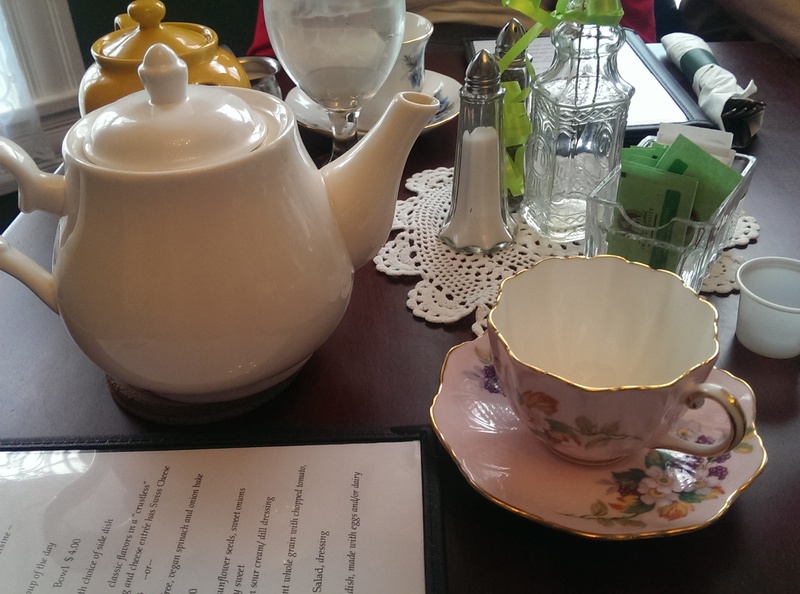 Located in a recently renovated century home in Twinsburg, Ohio, the tea house overlooks the town square. In fact, I almost missed it. It is on the southwest corner of the square. Parking is available on the street facing the square. 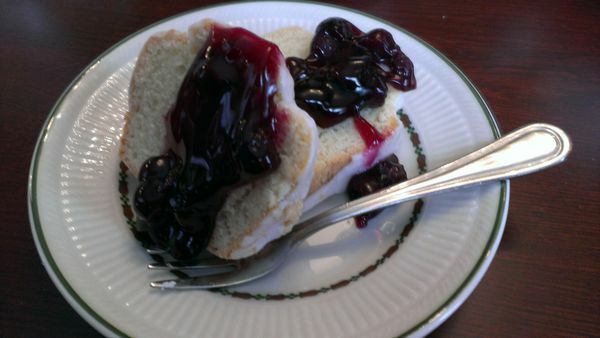 The tea house is open Wednesday through Saturday from 11-3. It seats 25. The staff was very friendly and accommodating, and the place smelled delicious. I came here with several members of my tea group recently. We enjoyed it very much and look forward to coming back soon. As a mostly vegan tea house I did not even miss the dairy or meat! My vegetarian friends were like kids in a candy shop. They said it was so refreshing to be able to order anything off the menu instead of only have one or two items to choose from. 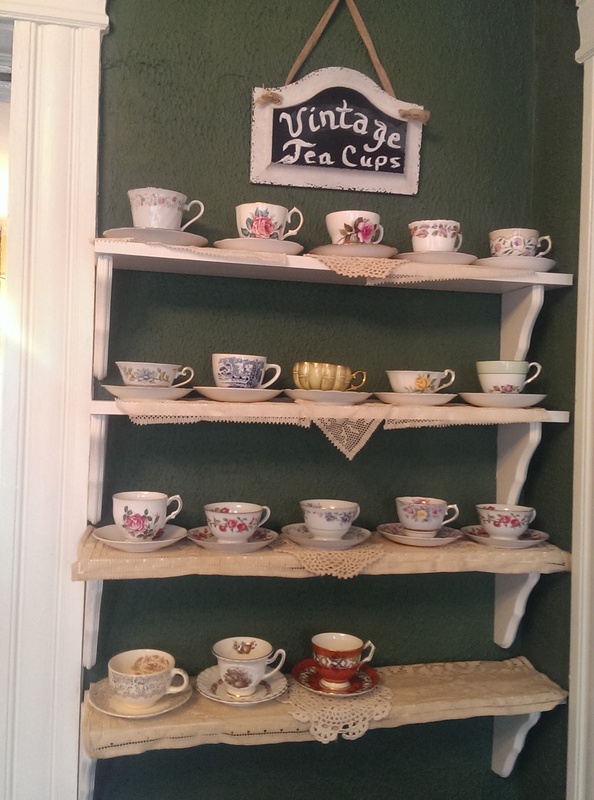 You can choose your own vintage tea cup from the wall shelf. They serve fair trade, organic teas and had a nice selection to choose from, including black teas, herbal teas and tisanes, and green teas. An especially nice touch: the owner brought around samples of the Moroccan mint tea that day, which I had already decided to order. It is a green tea with a nice mint flavor. I found it very refreshing. 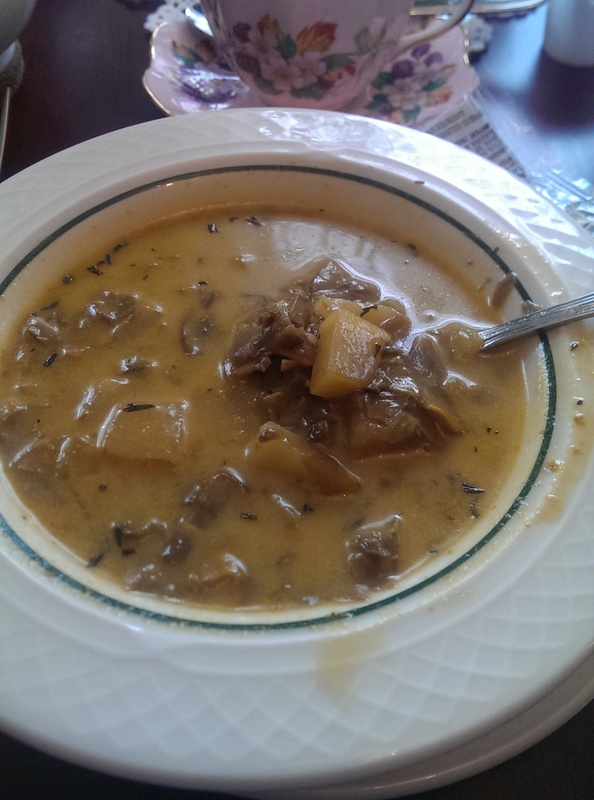 I ordered a bowl of the golden mushroom and potato soup with thyme because it made the place smell divine. It was as delicious as it smelled. The soup was chock-full of mushrooms and potatoes. The mushrooms were thinly sliced and flavorful, and the soup had a creamy consistency despite not having any cream in it. I was glad I ordered a bowl instead of a cup. For my entree I ordered the quiche in a “crustless’ version with eggs, Swiss cheese with onions and chives (not vegan but oh so good). A vegan version is also available. 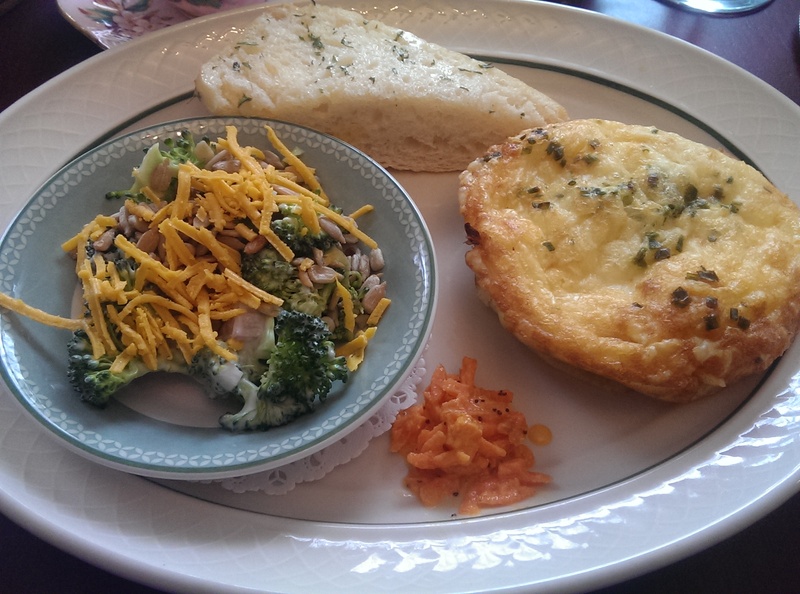 The savory quiche was extremely flavorful and hit the spot (I especially loved the side of garlic bread). I was able to choose a side dish and I chose the broccoli salad with sunflower seeds, sweet onions in vegan mayo base. I enjoyed it a lot. My friends raved about the desserts. 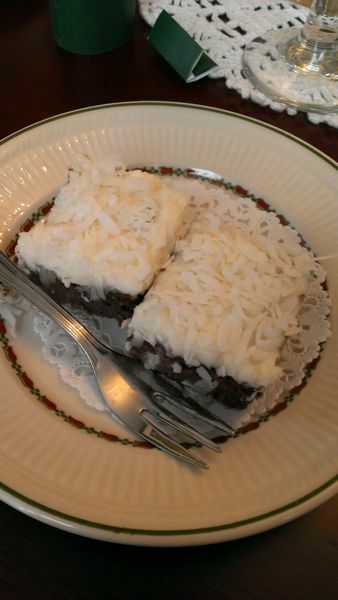 They loved the Twin Square Minis (above), which were little fudgey squares of goodness topped with coconut, and Lemon Tea Bread topped with a blueberry sauce (below). I was full from the bowl of soup and entree, so I did not even try a bite. We look forward to coming back and trying other things on the menu. 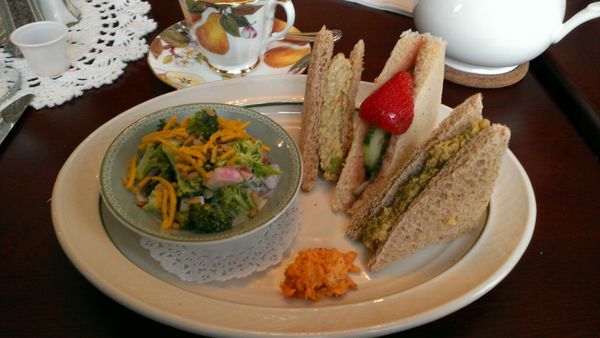 I need to try the trio of tea sandwiches next. The idea of tempeh salad with rosemary and sage is intriguing. Also, I tried a bite of my friend’s deviled chickpea salad and enjoyed it.